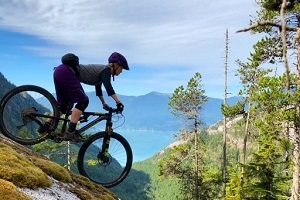 Always looking for a “rad trail” and “perfect flow”, Siohban Fox’s love of mountain bike riding in the North Shore Mountains is equally matched by her passion for teaching at GV. “I think it’s important to be engaged, dynamic, energetic, and empathetic. I love getting my students out of their seats and moving them around. Whether it’s to perform a dialogue or discuss a topic, I find movement keeps the class motivated to learn.” Click here for video.